Technology vanishes. It either succeeds and becomes ubiquitous or fails. For example, there was a time when networking and multimedia were computer buzzwords. Now they are just how computers work. On the other hand, when was the last time you thought about using a CueCat barcode reader to scan an advertisement? Then there are the things that have their time and vanish, like pagers. It is hard to decide which category digital cameras fall into. They are being absorbed into our phones and disappearing as a separate category for most consumers. But have you ever wondered about the first digital camera? The story isn’t what you would probably guess. The first digital camera I ever had was a Sony that took a floppy disk. Surely that was the first, right? Turns out, no. There were some very early attempts that didn’t really have the technology to make them work. The Jet Propulsion Laboratory was using analog electronic imaging as early as 1961 (they had been developing film on the moon but certainly need a better way). A TI engineer even patented the basic outline of an electronic camera in 1972, but it wasn’t strictly digital. None of these bore any practical fruit, especially relative to digital technology. It would take Eastman Kodak to create a portable digital camera, even though they were not the first to commercialize the technology. Large format photography gives a special quality to the images it produces, due to the differences in depth of field and resolution between it and its more modern handheld equivalents. Projecting an image the size of a dinner plate rather than a postage stamp has a few drawbacks though when it comes to digital photography, sensor manufacturersdo not manufacture consumer products at that size. [Zev Hoover] has created a large format digital camera, and is using it not only for still images but for video. And it’s an interesting device, for the way he’s translated a huge large-format image into a relatively small sensor in a modern SLR. He’s projecting the image from the large-format lens and bellows onto a screen made from an artist’s palette, a conveniently available piece of bright white plastic, and capturing that image with his SLR mounted beneath the large-format lens assembly. This would normally cause a perspective distortion, but to correct that he’s mounted his SLR lens at an offset. He does point out that since less light reaches the camera there is also a change in the ISO setting on the camera, but once that has been taken into account it performs satisfactorily. The result is a camera that allows something rather unusual, for Victorian-style large-format images to come to life as video. He demonstrates it in the video below, complete with friends in suitably old-fashioned looking steampunk attire. As your builds get smaller and your eyes get older, you might appreciate a little optical assistance around the shop. Stereo microscopes and inspection cameras are great additions to your bench, but often command a steep price. So this DIY PCB inspection microscope might be just the thing if you’re looking to roll your own and save a few bucks. It’s not fancy, and it’s not particularly complex, but [Saulius]’ build does the job, mainly because he thought the requirements through before starting the build. MDF is used for the stand because it’s dimensionally stable, easy to work, and heavy, which tends to stabilize motion and dampen vibration. The camera itself is an off-the-shelf USB unit with a CS mount that allows a wide range of lenses to be fitted. A $20 eBay macro slider allows for fine positioning, and a ring light stolen from a stereo microscope provides shadow-free lighting. We’d say the most obvious area for improvement would be a linkage on the arm to keep the plane of the lens parallel to the bench, but even as it is this looks like a solid build with a lot of utility – especially for hackers looking to age in place at the bench. While the official history of the digital camera begins with a Kodak engineer tinkering around with digital electronics in 1975, the first digital camera was actually built a few months prior. At the Vintage Computer Festival East, [William Sudbrink] rebuilt the first digital camera. It’s wasn’t particularly hard, either: it was a project on the cover of Popular Electronics in February, 1975. [William]’s exhibit, Cromemco Accessories: Cyclops & Dazzler is a demonstration of the greatest graphics cards you could buy for S-100 systems and a very rare, very weird solid-state TV camera. 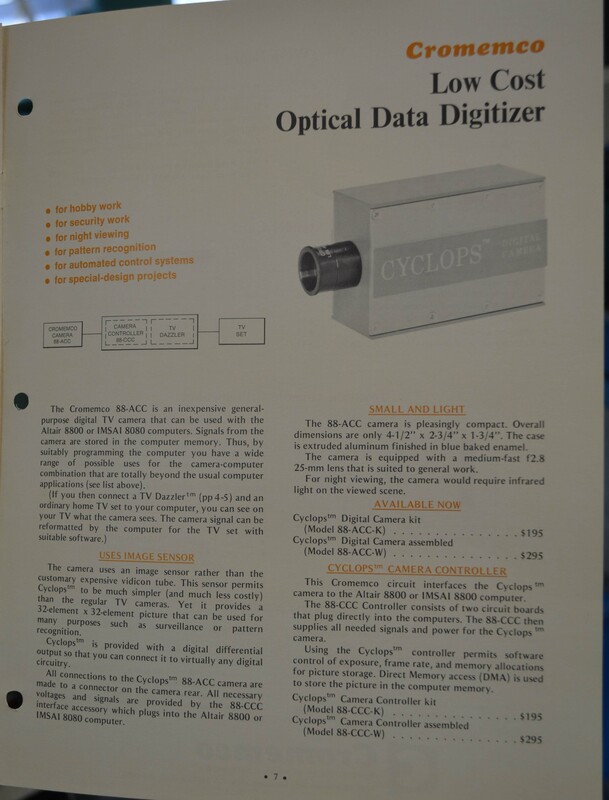 Introduced in the February, 1975 issue of Popular Electronics, the Cyclops was the first digital camera. This wasn’t a device that used a CCD or a normal image sensor. The image sensor in the Cyclops was a 1 kilobit DRAM from MOS, producing a digital image thirty-two pixels square. The full description, schematic, circuit layout, and theory of operation are laid out in the Popular Electronics article; all [William] had to do was etch a PCB and source the components. The key part – a one kilobit MOS DRAM in a metal can package, carefully decapsulated – had a date code of 1976, but that is the newest component in the rebuild of this classic circuit. To turn this DRAM into digital camera, the circuit sweeps across the rows and columns of the DRAM array, turning the charge of each cell into an analog output. This isn’t a black or white camera; there’s gray in there, or green if you connect it to an oscilloscope. This project in Popular Electronics would be manufactured by Cromemco in late 1975 and was released as their first product in January, 1976. The Cromemco was marketed as a digital camera, designed to interface with the MITS Altair 8800 computer, allowing anyone to save digital images to disk. This was the first digital camera invented, and the first digital camera sold to consumers. It’s an amazing piece of history, and very happy [William] was able to piece this together and bring it out to the Vintage Computer Festival this weekend. We are suckers for a teardown video here at Hackaday: few things are more fascinating than watching an expensive piece of equipment get torn apart. [Jonas Pfeil] is going the other way, though: he has just published an interesting video of one of his Panono panoramic ball cameras being built. The Panono is a rather cool take on the panoramic camera: it is a ball-shaped device fitted with 36 individual cameras. When you press the button and throw the camera in the air, it waits until the highest point and then takes pictures from all of the cameras. Sound familiar? We first coverd [Jonas’] work way back in 2011. Photos are stitched together into a single panoramic image with an equivalent resolution of up to 106 megapixels. The final image is panoramic in both horizontal and vertical directions: you can scroll up, down, left, right or in and out of the image. Since images are all taken at the same time you don’t have continuity problems associated with moving a single camera sensor. There are a number of sample images on their site but keep reading for a look at some of the updated hardware since our last look at this fascinating camera.